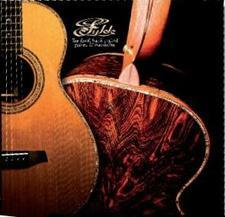 September 2008 will see the release of a stunning new book dedicated to FYLDE GUITARS. The book has been two years in the planning and is a truly wonderful thing to own. The title is FYLDE GUITARS, THE FINEST HAND-MADE GUITARS & MANDOLINS. Full colour throughout, this hard back volume is a must for all lovers of guitars no matter what instrument they chose to play. This book really is a testament to the outstanding work that Roger Bucknall has created for the best part of 40 years. FYLDE players reads like a who's who of world class musicians most of which are featured here. Needless to say I'm proud to have a significant presence throughout the book and I even take pride of place on the back cover where you can see me gazing lovingly at my prized collection of FYLDE guitars. The various chapters cover Roger's history, his philosophy on guitar making and the materials he uses. This book is a fine legacy to a dear friend and indeed one of the worlds finest guitar makers, and I know from various conversations with Roger that apart from telling the world about these fine instruments he wants to make it crystal clear that this is NOT a factory churning out guitars, but a small team of dedicated craftsmen making small numbers of beautiful instruments by hand with Roger at the helm making sure that every Guitar, Mandolin, Mandola, Bazouki and Cittern etc. is perfectly crafted to the enth degree and is the equal of any of the major makers anywhere in the world. Roger's contribution to instrument making in this country is immeasurable, and you only have to look at all the respected players that use FYLDE instruments to know that this small workshop in Cumbria produces the finest instruments to be seen anywhere on the planet. Oh dear, I think I have just gone off on one... grin. Seriously though, get your hands on a copy of this book, you won't regret it. It will give you hours of pleasure just glancing through its pages at these stunning works of art. Visit FYLDE'S website where you can see a great preview of the book and obtain details of where to purchase a copy. The price is £25 plus postage and packing. A bargain at twice the price methinks!